Grab someone special and spend the day swinging, enjoying the beauty of mother nature and getting some much needed relaxation with our handcrafted West Chest Porch Swing. The curved seat and angled back support offer an ergonomic seating position that will leave you sitting comfortably for hours and rise feeling rejuvenated. 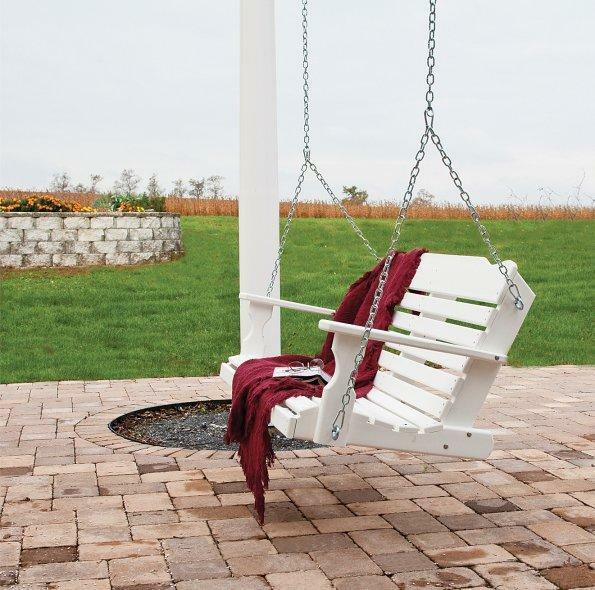 Each swing is made to order, with two different sizes to choose from, along with a rainbow of vibrant colors, ensuring you'll find the perfect swing to include in any decor! Choose from a 4' swing that will comfortably seat two, or opt for the 5' to gain extra room for two with the option to seat three people when needed. Our Leisure Lawns Poly Furniture is crafted from a poly material that comes from recycled milk jugs and detergent bottles. While keeping these out of landfills and helping to reduce our footprint, you're also investing in a piece of outdoor furniture that is made to last decades. (With a 20 year residential warranty to back it up!) The vibrant poly color that you choose is uniform throughout the material, ensuring it stays vibrant and will not chip, crack, rot, or develop mold. You can also put down the sander and wood sealer because these poly swings will not absorb moisture, resulting in the rotting, splitting, cracking and chipping that is normally associated with wooden outdoor furniture. Invest in your outdoor space knowing your new furniture will be ready for a relaxing afternoon, whenever you are! Give us a call with any questions you have or to place your order by phone. Our furniture specialists are the best in the business and ready to help you furnish the outdoor space of your dreams! *Price Does Not Include Frame. No Splinters, Splitting, or Cracking- always smooth to the touch! Just wanted to let you know we received the hardware we were missing. Thank you so much for your help with this matter. We LOVE our swing! It makes our front porch look beautiful...especially with our grand children swinging on it! I did get the email a short while ago. You and your company are the best. I only hope the customer service in my company is half as good to work with as you are.